I’m a kayak instructor now! The ACA is the leading organization in the U.S. for all things paddle sports. Whether you are looking to get certified as an instructor, or simply want to learn and develop skills (canoe, sea kayak, SUP, raft, white water kayak, surfski, rescue, adaptive paddling), check them out here. I’d also like to give a special shout-out to Levi Hogan, our wonderful instructor and new paddling friend. Levi and his wife operate Turnagain Kayak (located in Hope, AK), who specialize in outfitting groups for paddling in South Central Alaska, as well as kayak instruction. Levi is a BCU (British Canoe Union) 5 Star Sea Kayak Leader and ACA Level 4 Open Water Coastal Kayak Instructor Trainer. . . he’s kind of a big deal. For those of you who don’t know what the stars or acronyms mean, essentially Levi is a badass kayaker and loves to share his skills and knowledge with others in the courses that he offers. I highly recommend him as an instructor. Five of us returning guides for Anadyr Adventures (Valdez) piled into a company van and took off on a fun road trip to Homer. It’s impressive that we didn’t end up killing each other in the van. Just kidding (?). We love each other. 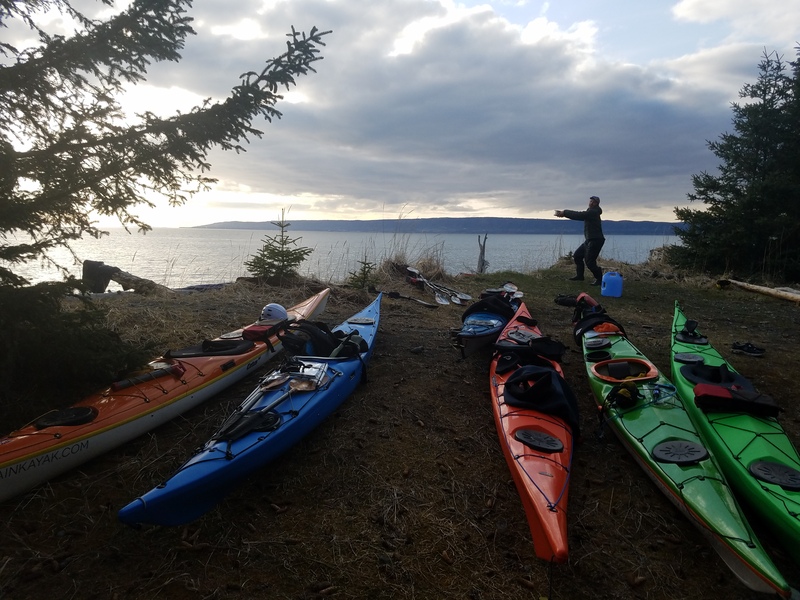 We spent 4 days with Levi camped at Right Beach in Halibut Cove (Kachemak Bay, less than an hour water taxi from Homer), working on refining paddling skills and teaching each other. Forward, sweep, reverse sweep, draw, sculling draw, low brace recovery, T-rescue, self rescue, towing, scoop rescue, Hand-of-God rescue. . . these are all paddling strokes and skills that we practiced and taught to each other. We also taught each other about paddling topics, such as cold water immersion, communication and signaling devices, weather and tides, and paddle and kayak design. Good stuff! I’m super excited to practice and teach to others the paddling skills that I’ve been developing over the past decade. As much time as I’ve spent playing and working on the water as a sea kayak guide, it’s great to take the time to slow down and go back to practicing and refining foundational paddling skills, such as the forward stroke. After this course, I feel better equipped to teach the subtleties of these foundational skills to beginner paddlers.
. . . Which brings me to Valdez, Alaska. There are two sea kayaking companies in this beautiful coastal town. One is Anadyr Adventures, for which I am going into my 7th guiding season. Anadyr has been in operation since 1989, and is the leading tour operator when it comes to kayaking. In addition to myself, this year Anadyr welcomes back 4 returning guides, of which 3 are returning for their 4th season! That’s pretty impressive. I’m not going to say anything negative about the other kayak company, as we have a friendly and professional relationship. However, they tend to have almost all-new kayak guides each year. This says a lot about Anadyr and the level of experience, commitment, and passion that the guides have. There is a reason that we keep coming back to paddle in Prince William Sound with the same company. Simply put, we love it! For Anadyr guides, especially myself, kayak guiding is a lot more than just a summer job. Paddling is a huge part of our lives. We do it for work. We do it for fun. We talk about it all the time. And most of us are planning on continuing to work towards higher-level kayak skills and instructor certifications. So, come join us. Come paddle with certified kayak instructors in one of the most breathtakingly beautiful places in the world! Check out these amazing kayak camping itineraries for an unforgettable Alaskan adventure. We’ll see you on the water.